The E-PL7 looks like a good solid camera for those who want to travel light and don't mind not having a viewfinder. Image quality promises to be very good. 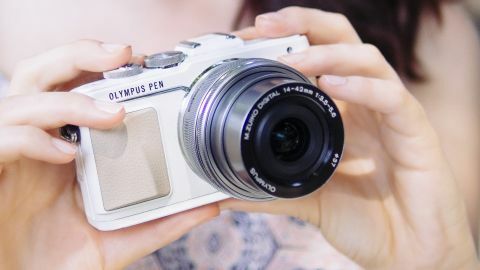 Olympus has received lots of praise for its OM-D series of compact system cameras, such as the OM-D E-M10, OM-D E-M5 and OM-D E-M1, but its Pen series has been a little overlooked in recent times. The new Pen E-PL7 doesn't introduce anything fundamentally different or novel; there's a screen that flips down (yes, down rather than up) through 180 degrees to facilitate selfies for example, and a couple of new Art Filters: Vintage and Partial Colour. However, what has changed is how Olympus is marketing the camera. The company is talking much less about the technicalities of the specification and much more about the creative potential of the camera. It's also going after the female market, especially bloggers and fashion followers. Inside the E-PL7, however, is a 16.1-million-pixel Live MOS sensor and a TruePic VII image processor, the same devices as are found inside the OM-D E-M10. This should mean that the new camera is capable of capturing the same high quality images. Unlike the OM-D series, the Pen series of compact system cameras don't have an electronic viewfinder built-in. The three-inch 1,037,000-dot screen on the back of the E-PL7, however, is still touch-sensitive and it can be tilted up for easier viewing when shooting below head height, or down through 180 degrees to help when shooting selfies. Olympus has used metal for the E-PL7's construction and it gives the camera a nice solid feel. The hinge mechanism of the screen seems a little clunky until you realise that there's a little arrow telling you to push it downwards before tilting it down for selfie shooting. One of the downsides of the screen tipping down for selfie mode is that you can't mount the camera on a tripod, which limits properly composed selfies to hand-held only. When the camera is in selfie mode the back of the hinge is visible, and it's a little industrial looking, but I'm told that this may not be the final look as the samples I had access to were pre-production. When the screen is tilted all the way down, a couple of icons appear at the bottom of the screen for selfie shooters. Tapping the Camera icon triggers the camera to take a shot, but tapping the other one triggers the camera to take a sequence of images using the self-timer. The number of images in the sequence and the length of time between each shot can be set by the photographer via the drive mode and self-timer controls. The screen gives a good clear view both indoors and outdoors, though I have yet to use the camera in bright sunlight. As with previous Olympus cameras, the screen responds quickly to a touch. The Partial Color Art Filter is well implemented as you select the colour that you want to remain via an on-screen colourwheel. This gives quite a bit of scope for refining the hue that you want to remain in the image. We have yet to use a full production sample of the E-PL7, but we have been allowed to publish full resolution sample images, so it can't be that far off readiness. Naturally we will test the camera fully when we get a production sample, but the early indications are good as the sensor and processing engine are tried and tested. Our initial images indicate that noise is well controlled, but the impact of noise reduction becomes apparent at normal viewing sizes when the upper sensitivity settings (ISO 12,800 and 25,600) are used – there's nothing unusual in that though. Colour and white balance also look to be well-handled. The Partial Color Art Filter can produce some fun results, but it needs to be used with care to avoid sickly portraits or predictable images. Although I was initially rather underwhelmed by the Pen E-PL7 (a tilting screen and a couple of new Art Filters is hardly going to start a revolution), it seems to be a good, solid camera that's capable of delivering high quality images.